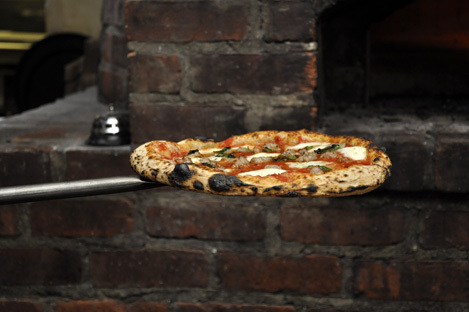 La Pizza Fresca is one of my favorite places to go in New York for a simple, casual meal. Although the atmosphere is informal the food is prepared with the highest-quality ingredients and is always delicious. Owner Brad Bonnewell has assembled a winelist I can only describe as extraordinary for both its depth and breadth. I think it is fair to say that La Pizza Fresca’s selection puts most lists in New York to shame, and that includes those of much more upscale establishments. Diners will find a jaw-dropping number of wines, including a veritable treasure trove of hard to find bottles. We started with the mozzarella di bufala, which I often order when I eat here. It is awfully hard to beat a plate of fresh mozzarella and San Daniele prosciutto. The grilled asparagus wrapped with prosciutto was also delicious. We shared a selection of the wood-oven pizzas for which the restaurant is most famous. I loved the signature La Pizza Fresca, which was topped with bufala mozzarella, fresh cherry tomatoes, black olives, Parmiggiano Reggiano and basil. The Monte Bianco (Robiola, Parmiggiano Reggiano, Fontina, porcini mushrooms and prosciutto) was rich and a terrific match with our bigger wines. Köfererhof has become one of my favorite Alto Adige producers. The 2005 Kerner provided much pleasure, with expressive layers of green apples, mint, minerals and tomato leaf supported by a vibrant minerality that gave the wine its gorgeous length and fresh finish. Bibi Graetz’s 2004 Colore (70% Canaiolo, 30% Colorino) was terrific. A massive, concentrated wine, it offered plenty of dark cherry fruit and stunning purity. Even though the Colore is considered the estate’s top wine, I thought the 2004 Testatamatta was even better. A blend of 85% Sangiovese and 15% Canaiolo, it revealed detailed, nuanced aromatics and flavors, with superb follow-through on the palate, fine tannins and an overall sense of harmony that kept me coming back to it throughout the evening. My original Wine Advocate score of 94 points may have been conservative. This was a phenomenal showing by one of Tuscany’s top wines in the profound 2004 vintage. Those in the know are well aware that in 1986 Bruno Giacosa produced several outstanding wines, including his monumental 1986 Barolo Riserva Falletto, a wine I never pass up when I have a chance to drink it. Although this bottle was not the best I have ever had, it nevertheless drew us in with its mysterious personality. The wine took some time to open up but with air it its massive dark fruit and classic Serralunga notes of iron, tar and licorice gradually emerged. It continued to change throughout the evening, gaining precision and focus with each successive taste. The 1986 Barolo Falletto Riserva remains one of my all-time favorite wines from Bruno Giacosa.